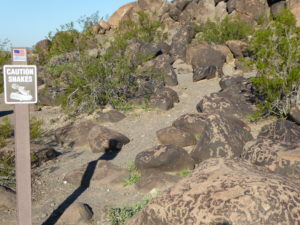 We left Yuma and headed east to the Painted Rocks Petroglyph BLM Site. 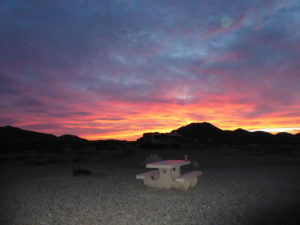 This was a different type of BLM area – it had designated campsites where each site had a picnic table made of concrete and a fire pit. 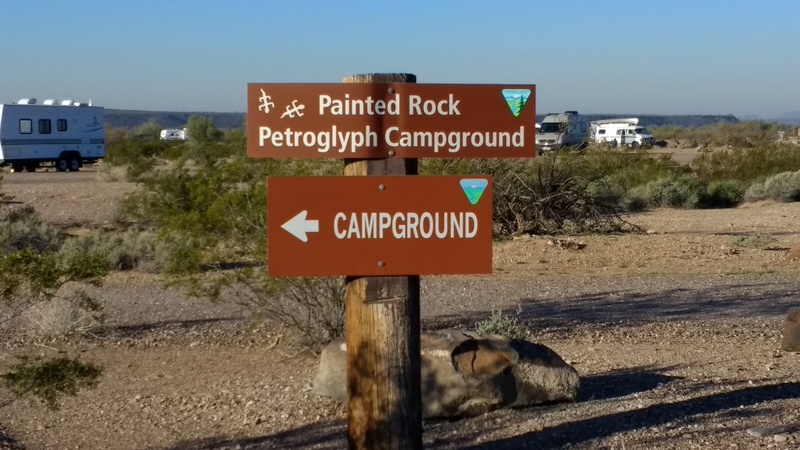 This campground had a small fee of $8 per night or $4 per night with the senior pass. 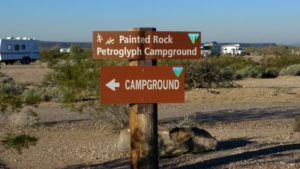 It was a large campground with 60 well spread out sites in two loops and a walk around each loop was a two mile walk. We did that walk every morning as part of our morning exercise routine as well as some calisthenics. 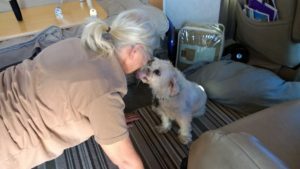 Heidi thought she would give Kathy some encouragement one morning! There was a large grouping of rocks at the site that had numerous petroglyphs on them that you could walk through and observe. This area could also be accessed through a day use area for those not wishing to spend the night. 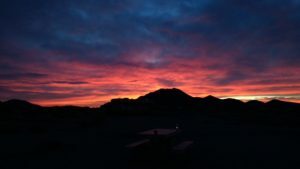 While at Painted Rocks we saw some beautiful sunrises and sunsets. We didn’t see any wildlife but we did hear coyotes howling almost every night. The area had a lot of trails for 4-wheel drive vehicles. We were able to ride our bikes down one of them a little ways. 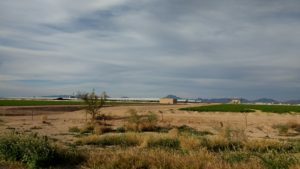 The area was a region with a lot of farming in it. There was a huge ranch – the Painted Rock Ranch close to the campground. 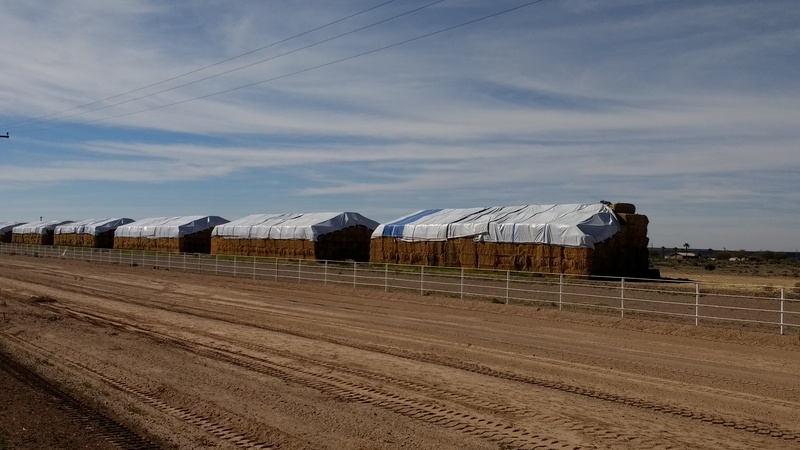 It was a large operation that had cattle and had acres and acres of land under irrigation. 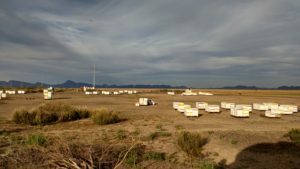 There were acres of huge square bales of hay put up with large areas of honey bees for pollination. 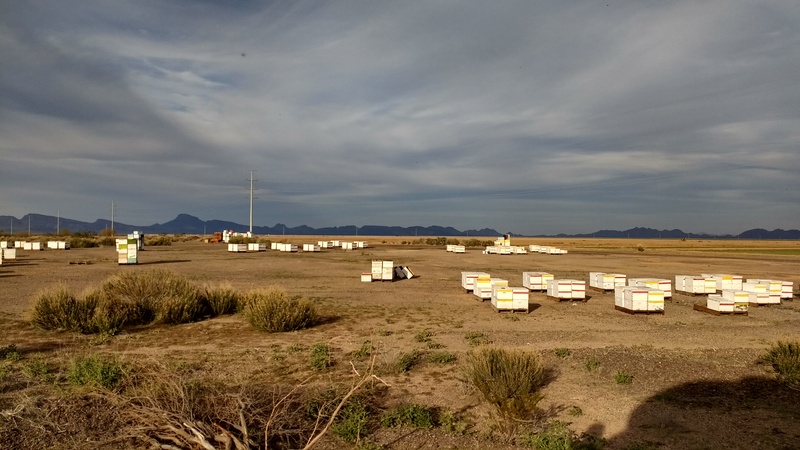 This large area of bee hives is part of the Painted Rock Ranch. 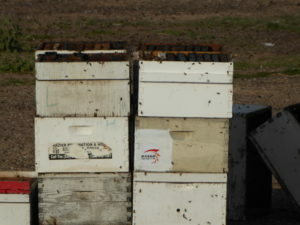 A couple of tops were off the hives and the bees were swarming! 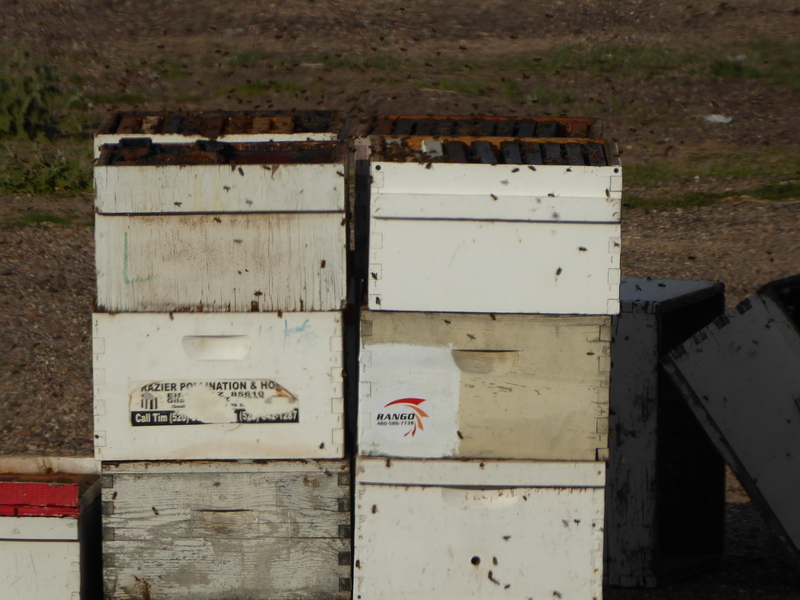 The bees were very active – we had to run back to the camper! It was a really beautiful place. Heading south on Rt. 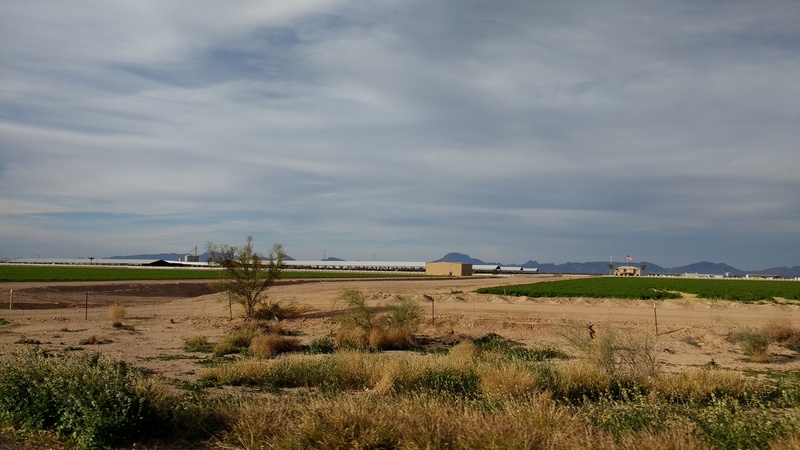 85 we spent one night at Gunsight Wash BLM land on our way to Organ Pipe National Monument, so that we could visit the towns of Ajo and Why Arizona. Before entering the BLM site we encountered a rather intimidating sign warning us of illegal activities. We were happy to see several other rigs set up throughout the grounds, so we knew we would have neighbors. Lorraine, the campground host came out and greeted us. She was a women in her 70’s who was on her 2nd year of hosting this BLM land for the summer. When we told her we were from PA she was surprised and said we were the first Pennsylvanians to register during her two years of hosting. She was from Allentown, PA. There were several bumpy paths throughout the desert and we had to drive slowly. 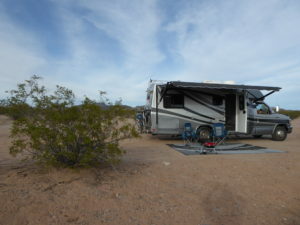 We set up camp near the edge of a dry wash and enjoyed a relaxing evening. 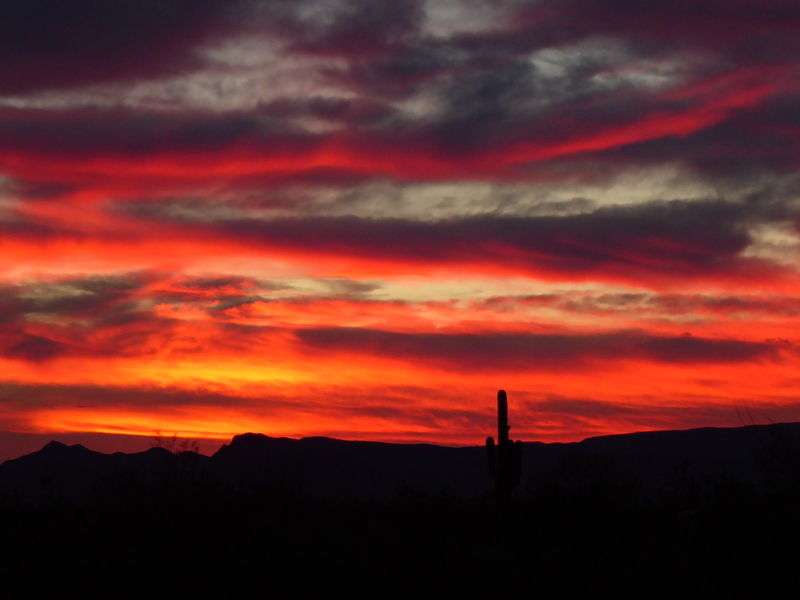 We will leave you with a couple of sunsets. 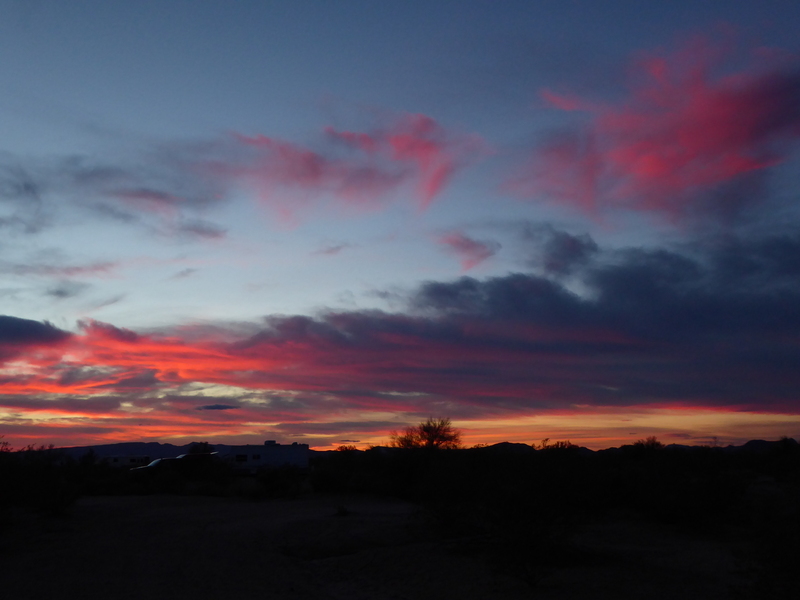 And so, another beautiful evening in the Sonora desert. This entry was posted in Arizona and tagged Boondocking, Gunsight BLM, Painted Rock. Bookmark the permalink. 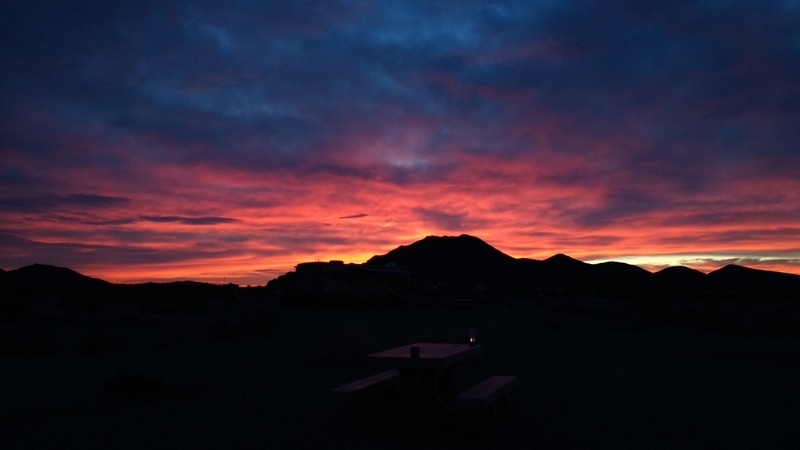 We can’t get enough of the sunrises and sunsets! It is becoming a highlight of our trip. Wow ! Love the pictures of sunrises and sunsets! Thank you, Gordon. We know that Lida will love the new camper! Wow gorgeous sunsets— glad to see ya’ll are enjoying the trip! Sunrises and sunsets were one of the reasons for wanting to see the desert. We are enjoying them immensely! Beautiful pictures! The watch out for snakes is a little creepy. Thanks for posting. I am enjoying reading about all your adventures. Still a bit chilly for snakes, thank goodness! 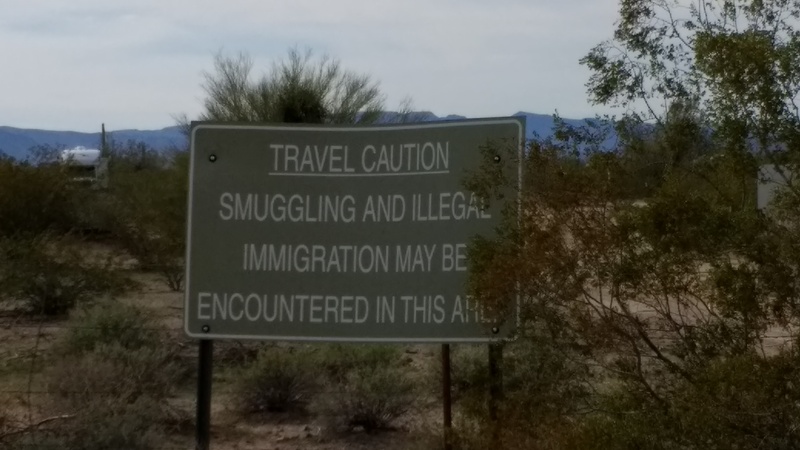 Haven’t seen any desert wildlife yet, except coyotes. Glad you’re enjoying our blog.